Both phones come with support for the blazing fast AT&T 4G LTE network and should appear on the shelves in the second quarter of this year. But the question remains – which one is the right one for you. We’ll try to find the answer to that by comparing them to one of the best pre-CES WP smartphones – the Samsung Focus S.
Let’s start with the highlights. The HTC Titan II has the impressive 16MP camera (check the camera samples here) and 4.7-inch S-LCD screen as its key selling points, while the Nokia Lumia 900 impresses with a gorgeous polycarbonate unibody and an ClearBlack AMOLED, which is a real joy to behold. And now we are off to the actual comparison table. As it happens the Samsung Focus S beats both the HTC Titan II and Nokia Lumia 900 when it comes to size and weight. However one cannot simply ignore the 16MP camera of the HTC Titan II. We can’t say if it is blowing the fish out of the water just yet, but it’s pretty certain that if it’s a WP-running cameraphone you want, the Titan II is one of your best bets. In addition, it’s the only one out of the contenders which has a metal unibody. And finally, we have the Nokia Lumia 900, which is a great balance between looks and functionality. Sure, it might be a bit on the heavy side but it comes with free lifetime voice-guided navigation and that curved glass that makes all those swiping gestures feel so natural. A penny for your thoughts. 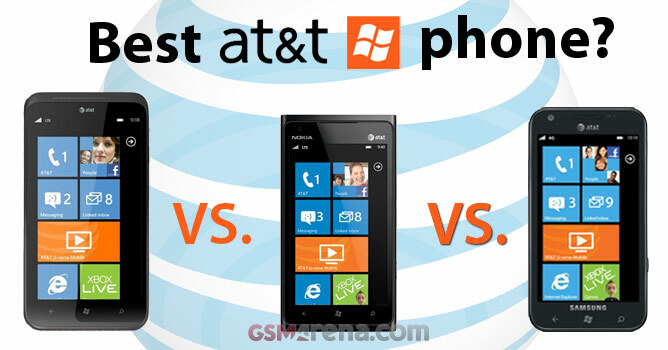 Which one of these Windows Phone powerhouses would you pick and why?